Material: made of 600D encryption oxford cloth. - High-quality 600D oxford material, stronger tensile strength and wear resistance, comfortable and durable. - Front and back adopt molle design, can easily carry other small devices. 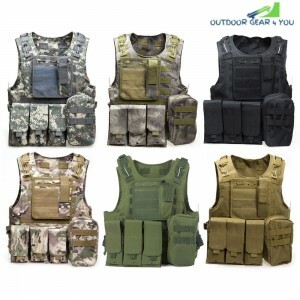 - Shoulder and waist side part adopt magic tape and buckle design which enables you to wear and take off this tactical vest rapidly and conveniently. - With 3 detachable accessory bags to meet different storing need. - One of the accessory bags adopts a large magic tape design, where you can paste a badge as your identification. - Material: made of 600D encryption oxford cloth. Note: this tactical vest fits for people less than 100kg. The waistline can be adjusted by the adjustable strap at the side and the max perimeter is 112cm / 44 inches. The linking rope color might be different slightly.